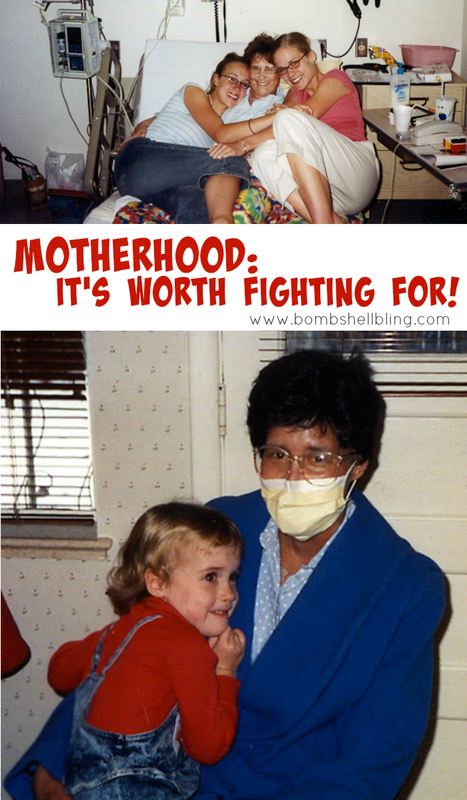 Motherhood: It’s Worth Fighting For! This week I am doing something different and special: to gear up for Mother’s Day on Sunday I will be posting essays on motherhood each day this week written by my sister and myself. My sister, Rachel Nielson, is a writer and editor for the site Power of Moms, and all essays have been republished with permission. She is a mother of two babies, both of whom she worked very hard to get. Her son entered their family through the miracle of adoption, and her daughter entered their family though the miracle of IVF. She is a wonderful mother, a strong woman, a deep thinker, a powerful and talented writer, and a fabulous sister. This is one of my all-time favorite pieces that she has written. It is about our incredible mother and her 13 year battle with breast cancer. I hope that it touches your heart. No one has taught me more about optimism in the face of adversity than my mother. When she was only 35 years old, she was diagnosed with stage 3 breast cancer. She told her doctor that she would not lose the battle—that she had three little girls to raise—and she fought for 13 years to make that happen. We were just 8, 6, and 3 when she was first diagnosed, and we were confused and frightened by what was happening to our mother. After many months of chemotherapy, she spent almost three months in the hospital recovering from a bone marrow transplant. Before her operation, she recorded our favorite storybooks on cassette tapes so we could listen to her voice reading to us each night. I have a vivid memory of snuggling up next to her and my sisters, watching as she fiddled with my dad’s dictophone and listening as she read “The Magic Pot” in her energetic voice. During the months that she was in the hospital, we occasionally got to visit if she was healthy enough. I remember climbing into her hospital bed one day and telling her that I wished she could see me in my Halloween costume. I didn’t understand then why tears streamed down her face as she told me that there was nothing in the world she would like more. 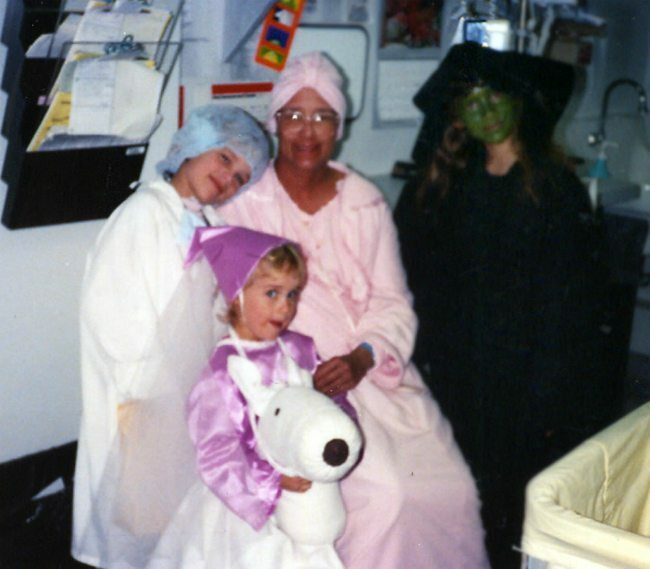 She didn’t get to go trick-or-treating with us that year, but we did pay her a visit in her hospital room. She came home on Thanksgiving Day. Her little girls dressed up as Indians and pilgrims and stood on the porch awaiting her arrival. 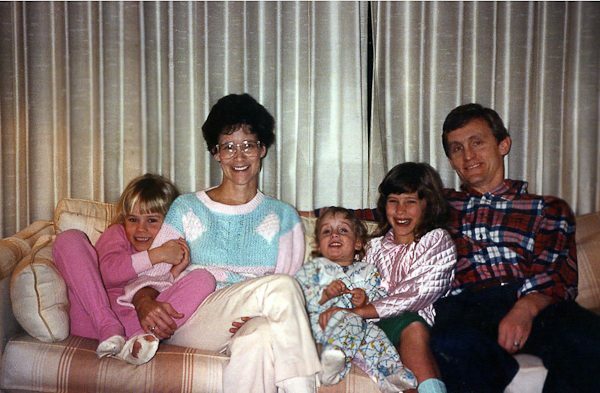 I still remember the way that my heart pounded in excitement as the brown station wagon pulled up to our house and my frail mother emerged, clinging to my dad’s arm, smiling and crying. Truly, it was the most joyous Thanksgiving our family has ever had. She had lost her energy and her hair; but she had not lost her spirit and her sense of humor. On Christmas morning that year, she posed for a photo with my new Mrs. 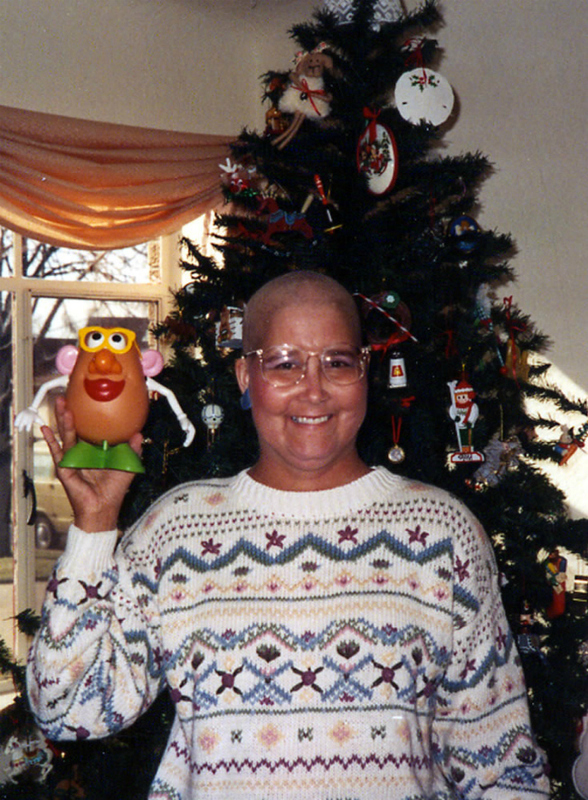 Potato Head doll, just to make her little girls laugh and to remind us that she was still our goofy mom, even with her swollen face and bald head. When I look at this photo of my mother, I see true beauty. 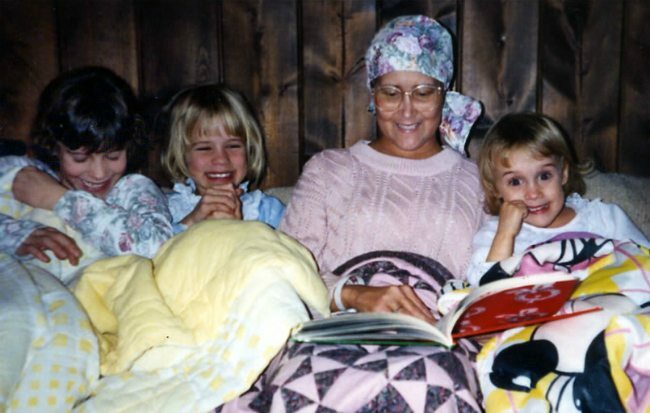 Over the subsequent years, she went in and out of remission many times, but through it all she kept her sense of humor and her determination to love and raise her daughters. Her optimism blessed us with so many beautiful memories. 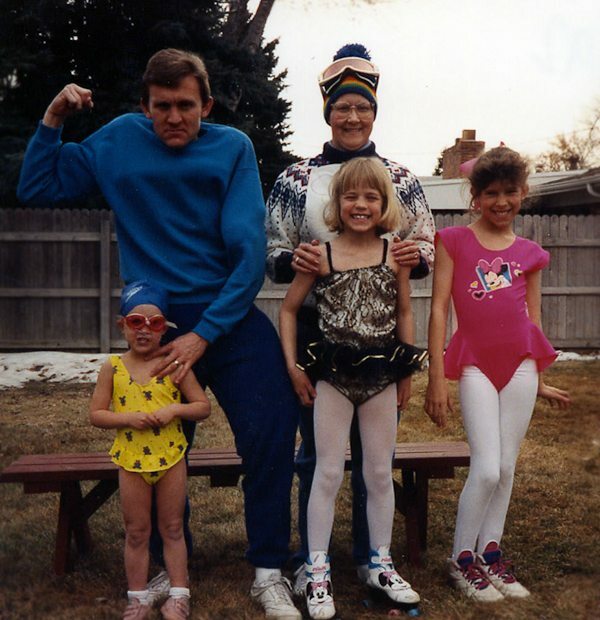 Planning fun for her family was an “escape” from her illness, and she loved to plan creative birthday parties, such as the Westover family Olympics! My mom was so grateful to make it to her 40th birthday and to celebrate her health with family and friends. 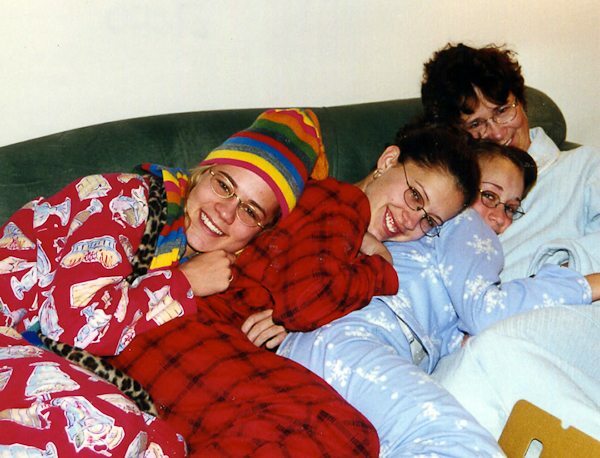 She loved cozy moments with her daughters, like this one on Christmas morning. Always a good sport, my mom joined in her teenaged daughters’ antics, such as posing in our fancy hotel bathrobes when we were on vacation as a family. 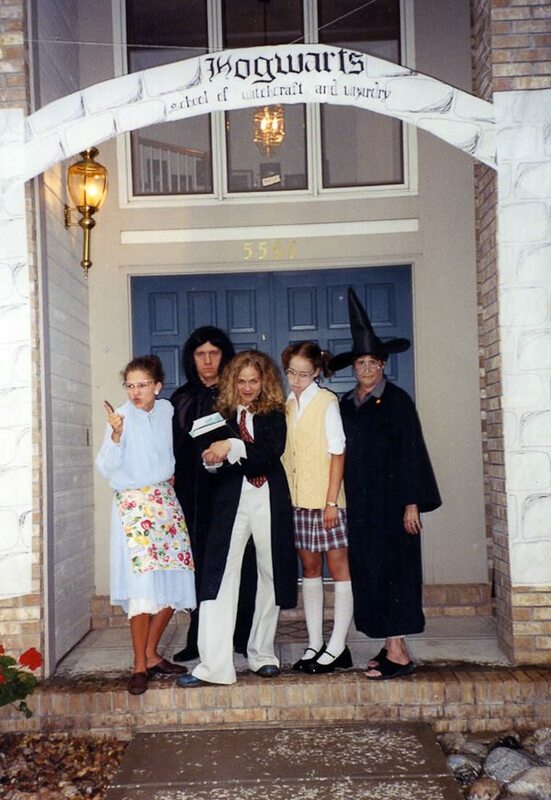 In the height of her illness, my mom helped me plan a Harry Potter party for my 19th birthday. It was a night of silliness, whimsy, and joy, despite the trial our family was facing. On the morning of July 14, 2003, I climbed into my mother’s bed, just like I did when I was a little girl. 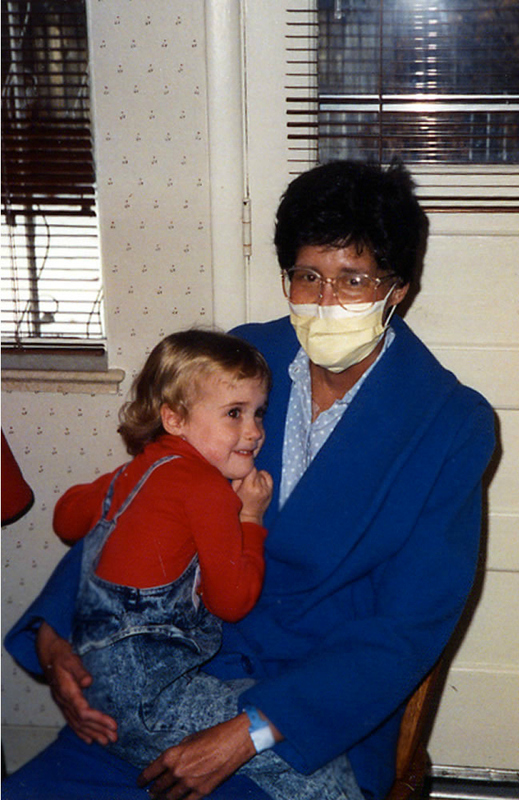 I was 19–my sisters were 21 and 16–and five months earlier, we had received the news that our mother’s cancer had reached her brain, and we didn’t have much time left with her. That morning, I wrapped my arms around her and told her I loved her and was so grateful for the life she had given me. With tears in her eyes, she said to me, “All I ever wanted was love in our home—and I got it. I got everything I ever wanted.” She passed away just a few hours later. I honor and thank her for everything she gave me, particularly her example of enduring even the most difficult of life’s trials with optimism. I’m sure there were many days when she cried bitter tears of sorrow, pain, and anger; I’m sure there were times when she lost her temper with her daughters due to exhaustion and physical pain; but through it all, she was somehow able to face each day with faith, joy, and, above all, a deep love for her family. I think of my mother every day, particularly when I am going through a difficult struggle. Before she passed away, she made a baby blanket for each of her daughters so when our own babies arrived, we would be able to wrap them up in their grandmother’s love. My journey to motherhood was long and difficult, with years of infertility and adoption disappointments, and I often longed for my mother’s advice and comfort. But I tried to face those challenges with the optimism and resilience that she had always modeled for me. When my son finally arrived through the miracle of adoption, I cried tears of joy as I wrapped him in my mother’s blanket and sang him the lullaby that she always sang to me. The greatest legacy that my mom left her daughters is her example that life is beautiful and motherhood is beautiful—and both are worth fighting for. 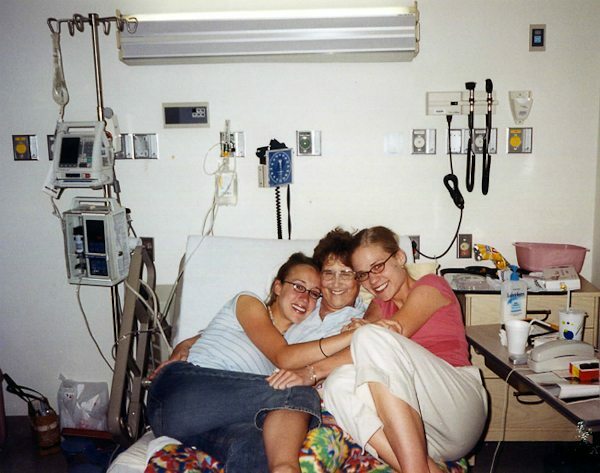 For more on our amazing mother see my post entitled What My Mother’s Battle With Cancer Taught Me About True Beauty and Snapshots of the Emotional Stages of Mother Daughter Relationships. Rachel loves birthday surprises, summer sunsets, and a handsome man named Ryan. She taught high school English for five years before deciding to be a stay-at-home mom to their two miracle babies. Rachel runs the wonderful 3 in 30 Podcast, designed to help busy moms live more fulfilling lives. Rachel also writes guest blogger posts for Power of Moms and Bombshell Bling, and nothing gives her more satisfaction than capturing in words the deepest feelings of her heart. Sarah, this story is so amazing. I just read it through tears!! I am so glad that we were able to meet at SNAP and become friends!! Thank you for sharing this with me. What a wonderful post for a fun Mom. Harry Potter Party? Love It! Thank you for sharing this on the Wednesday link up, A Little Bird Told Me. After a long day, I am so glad I was able to read this. Sad, yes. But, wow. Your mom was truly an amazing woman, and from the sounds of it, she did a great job raising amazing kids too! My heart goes out to you and your family. I’m so glad you are able to have so many wonderful memories though. Again, thank you for sharing. Such a beautiful life your mom had. It makes me want to be a better mom. Thanks for linking up to the Bloggers Brags Pinterest Party. I have pinned your post to the Bloggers Brags Pinterest Board. What a beautiful post. Thanks for sharing it with us all. This is so beautiful, what an amazing woman. Her last words broke my heart, she is right…all that matters is love in a home. Thank you for sharing! This makes me want to spend every second with my kids!